After much frustration trying to keep my canopy from rattling using the plastic rear canopy seals from Fletchair (and the little stabilizing rubber blocks on the original), I finally threw up my hands and developed this solution. Unlike the replacement seals from Fletchair, which quickly scuff the paint on the turtle back, the felt used in this solution has had no effect on my paint after 3 years. Although I did this modification while I had the canopy off, it's clear that it can be done with the canopy installed on the aircraft--probably in less than 30 minutes. Two large, high-resolution photos at the end of this document show details of my installation. Temporarily affix a single piece of felt in place to the inside of the canopy for experimentation. I used little bits of Velcro. You can use contact cement, but be sparing because you may have to move the felt strip several times to get it positioned correctly. Begin by positioning it 1 inch from the rear edge of the canopy. In my installation, the correct position was 1/2 inch from the edge. The felt strip is positioned correctly when the canopy is moderately hard to close. A fair amount of speed is required to push the canopy the last six inches, and you'll feel that the latch is really working to snug the canopy against the bow. There will be zero lateral movement of the canopy. Now cement the felt permanently to the inside of the canopy. I used Grip brand contact cement. (Others have used carpet tape instead of contact cement.) Close the canopy, and leave it alone. Let it set for 24 hours, after which it will be easier to close. With time, the felt becomes permanently compressed between the canopy and the turtleback. The compression continues over the next few weeks until the canopy feels like a perfect fit, requires no extraordinary effort to close, and has no rattles or air leaks. 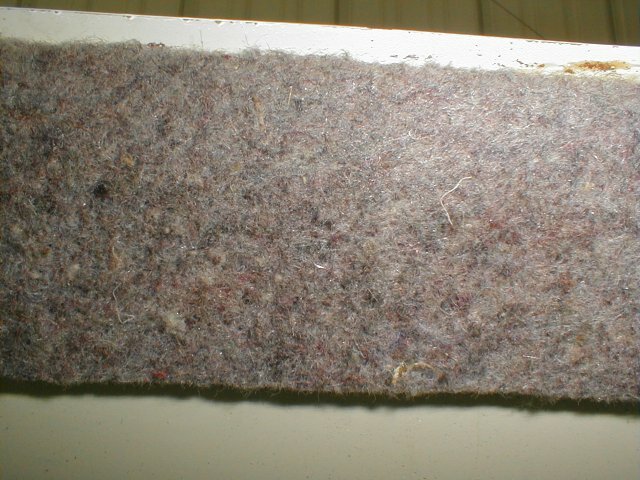 If after a while, you feel you've over-done it in the snugness department, use a razor knife to remove 1/2 inch from the rear edge of the felt. If you hangar your plane, leave the canopy open a few inches to keep the felt (and the rubber bow seals) resilient. Although I used 3-inch wide felt strips, it's clear from the wear marks that 2-inch strips are sufficient. 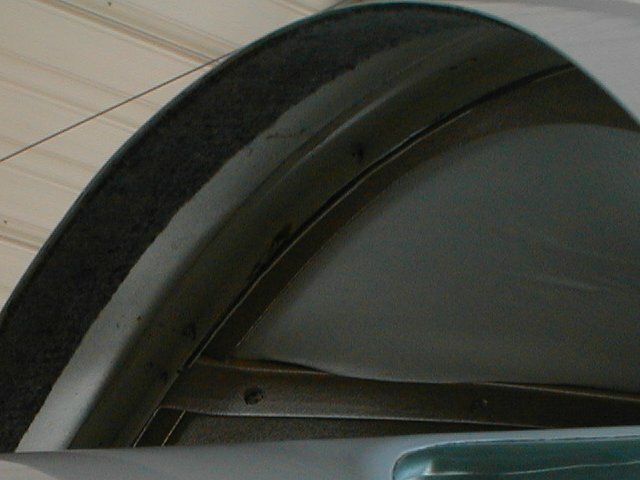 The strip is glued about 1/2-inch for the rear edge of the canopy. This shot is taken upward from the cargo door.